Learn how to utilize this extremely effective intensive method in your everyday treatments with your pediatric and adult patients who could benefit from increased proprioception instantaneously. Although intensive programs consisting of 3 to 4 hours per day are ideal, your patients can still benefit from using the NeuroSuit™ in their weekly sessions in physical or occupational therapy. The NeuroSuit™ through the use of strategically placed bungees brings your patient’s body into correct alignment simultaneously gently compressing the joints causing a vertical loading. This additional weight bearing affect helps send strong messages to the central nervous system and through increased proprioceptive input, the patient learns to move in these correct motor patterns more effectively. The results can be quite astounding! Patients often display an increase in overall strength quickly as all movements are assisted through the bungees yet simultaneously resistive. It is not uncommon to see new motor patterns begin to emerge in just a few treatments. If incorporating using the NeuroSuit™ into your practice isn’t feasible at this time, we also offer courses which teach techniques to make your traditional treatments more intensive. 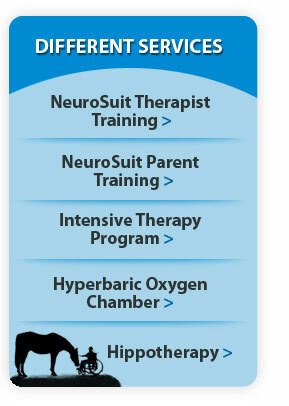 Check our news page for upcoming courses or email us at NeuroSuit@gmail.com to request more information.